One of the big changes in iTunes 11 is the new MiniPlayer. The iTunes MiniPlayer has been around for years, but its functionality has been enhanced with iTunes 11. In addition to being a control center for playing your music, you can also use it to search for songs, playlists, and more, and to access the Up Next queue. Here’s how you can get the most out of the iTunes MiniPlayer. First, if you want to use the MiniPlayer, you need to display it. In iTunes, choose Window > MiniPlayer, or press Command-Option-3, to display this window. This will bring up a MiniPlayer in addition to the main iTunes interface. If you want to just use the MiniPlayer, click the rectangular button at the upper right of the main iTunes window (just to the left of the control to enter full screen), select Window > Switch to MiniPlayer, or press Command-Option-M. Here's the MiniPlayer window while a song is playing. It shows the title on top in bold, and the artist below. So what can you do with the MiniPlayer? Of course it can tell you what’s playing, but it does much more; you can access a number of controls if you hover your cursor over the MiniPlayer window. The MiniPlayer lets you control iTunes playback. First you’ll see an X and below it, a rectangular-shaped button. 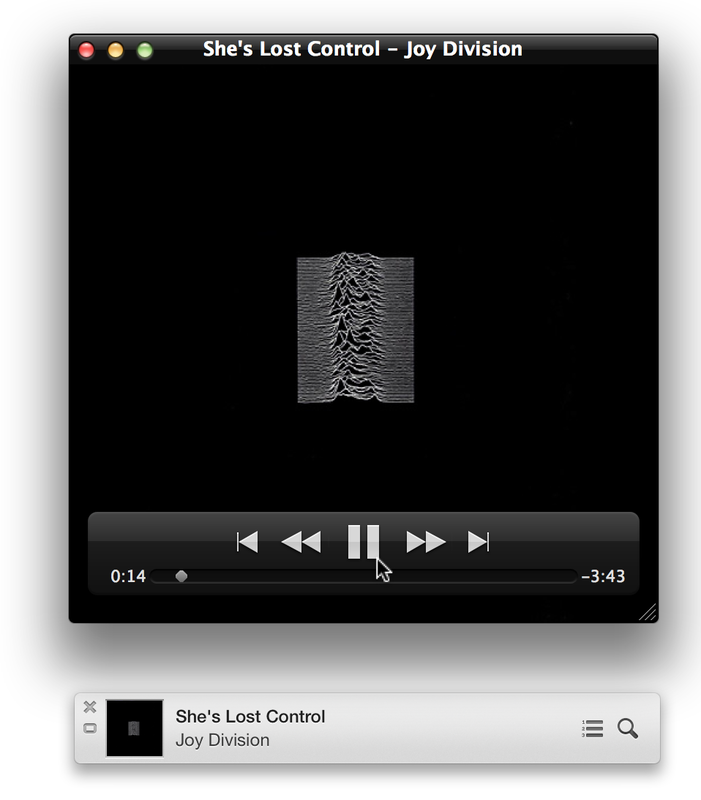 The former closes the MiniPlayer, while the later expands the MiniPlayer back to the full iTunes interface. Clicking the > button displays a contextual menu that lets you rate the currently playing song, play it next, add it to the Up Next queue, add the song to an iOS device or to a playlist, and go to it in your iTunes library or in the iTunes Store. Note that this button only shows up while music is playing. The next three buttons are for controlling playback: They are previous, play/pause, and next. The AirPlay icon lets you do two things. First, there’s a volume slider here, which you can use to change iTunes’ volume. 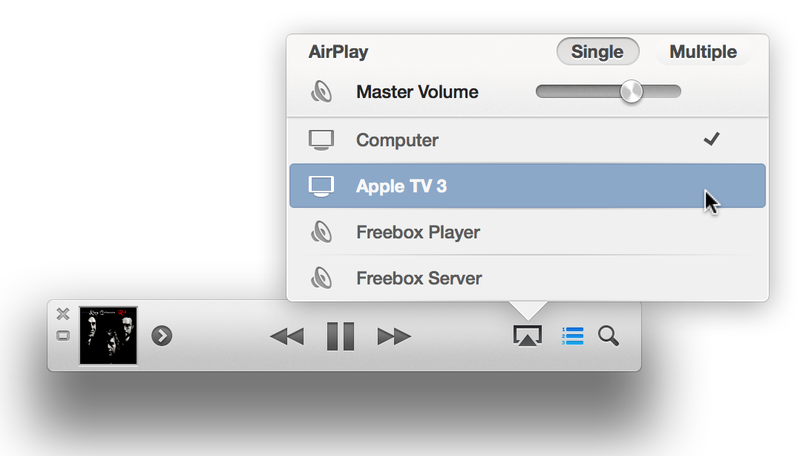 Second, you can choose to stream your music to one or more AirPlay devices from this menu. The next icon is the Up Next icon; you can access the Up Next queue here. You can move songs around in the queue, remove them from the queue, or play songs you’ve listened to recently. Finally, the Search button lets you search your iTunes library, finding content that you may want to play right now, or add to the Up Next queue. If you click the AirPlay icon, you’ll see a menu showing any AirPlay devices you have, as well as a general volume slider. The AirPlay menu displayed from the MiniPlayer. As you can see to the right, Computer is checked. If I want to send audio to my Apple TV, I just need to click on its line. You can send audio to multiple devices as well; click on the Multiple button, and check the ones you want to use. And the Master Volume slider adjusts iTunes’ volume; if you choose to stream to multiple devices, each of them will also have its own volume slider. The MiniPlayer gives you access to your Up Next queue; just click the Up Next icon to have the queue display. You can see what’s going to play soon; what you’ve recently played (click the clock icon); and you can drag tracks around, delete them, and more. Check out our extensive review of iTunes 11 to find out more about what you can do with Up Next. If you click the magnifying glass icon, a search field appears on the MiniPlayer. 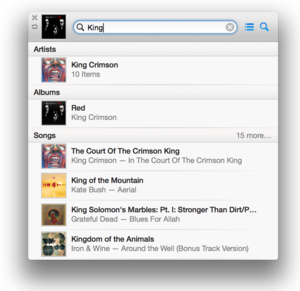 Type one or more words, and you can search your Music library from the MiniPlayer (by contrast, the search box in the main iTunes window lets you search your entire iTunes library if you want). Search results will display quickly in a menu below the MiniPlayer. Search results display sorted by type. From this list, you can hover over an item and click the > icon to display a contextual menu to add items to Up Next, play them next, and perform other operations. If you double-click an item, it will start playing. The MiniPlayer is missing one important thing: a progress bar. The previous version of this tool had one, so you could see where you were in a track, and skip ahead or back if you wanted to. You might not need this feature as often for music, but I always found it particularly useful for podcasts. The Artwork Player lets you see a progress bar, as well as other controls. You can, however, get similar functionality by clicking the album artwork at the left of the window. This displays the Artwork Player—hover your mouse over this floating window to see controls and a progress bar. As you can see above, the Artwork Player also has other controls, but they’re more easily accessible from the MiniPlayer. There’s nothing stopping you from displaying both of these windows, if you have enough screen space. If you want to use this, and keep it above other windows, iTunes’ Advanced preferences has a 'Keep movie window on top of all other windows' window. Select that option and it will keep the Artwork Player visible at all times. 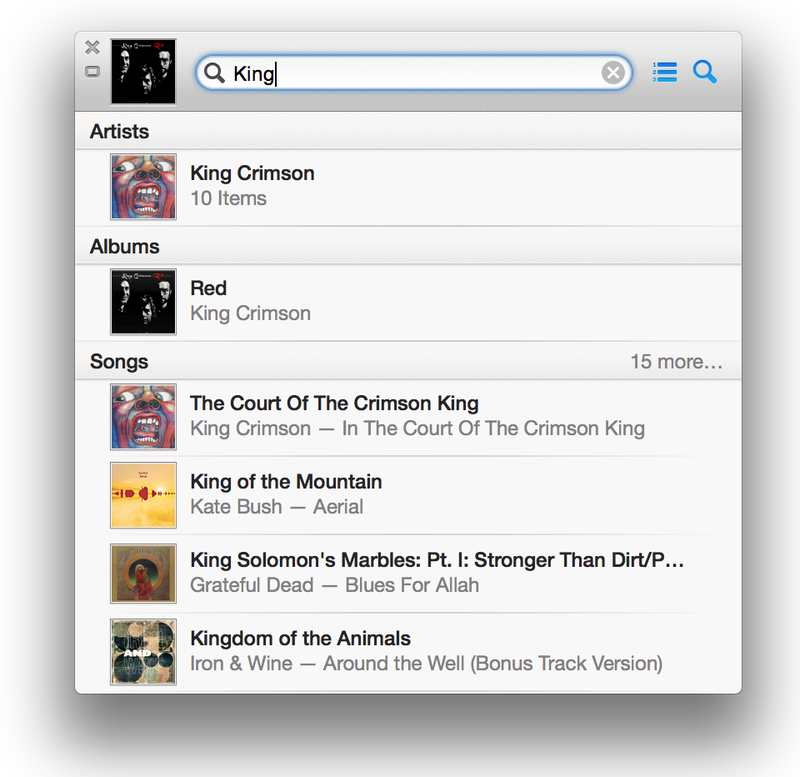 The MiniPlayer is a great tool to control iTunes, manage what you’re listening to, and quickly search for music. If you get used to it, you may find yourself controlling much of your listening from this small window instead of visiting the main iTunes window.